This LibGuide is intended to lead you through the process of finding information (evidence) in the practice of Evidence-Based Healthcare. For more information on Evidence-Based Healthcare, consult the reading lists at the end of the guide. Glossary produced by the Centre for Evidence-Based Medicine, Toronto. 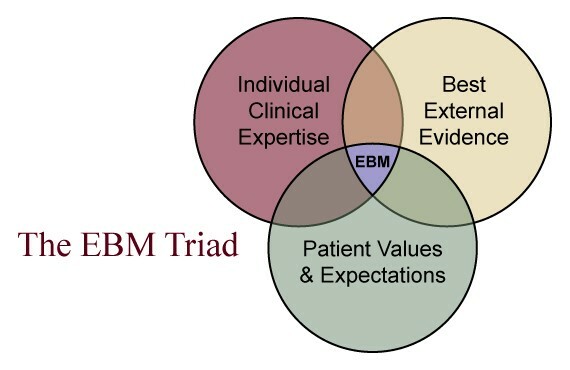 “Evidence-Based Medicine is the integration of best research evidence with clinical expertise and patient values"
The EBM Triad. Florida State University. College of Medicine. The practice of EBM involves a multi-step process (sometimes called the five A's) of identifying the best evidence and then evaluating it for validity, importance and applicability. •ACCESS Search for evidence - use the library! It is in the first two steps of this process that the library can be of assistance to you, helping you with keywords and finding the best evidence. Please contact a Reference Librarian if you need assistance in finding the best evidence!